Q. On what days are you open? A. Parham House and Gardens are open on Wednesdays, Thursdays, Fridays, Sundays and Bank Holidays throughout the Season (Easter Sunday – October 13th in 2019). Please note that days and times may vary on Event days, and so please always check here before your visit. Q. What are considered to be ‘Event Days’? A. The Nursery & Garden Shop opens at 10:30am until 12 noon (Wednesday, Thursday, Friday and Sunday). The Gardens and Big Kitchen open at 12 noon and close at 5:00pm. The House opens at 2:00pm and closes at 5:00pm. 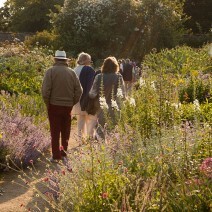 Last admission to the House & Gardens is 4:30pm. These opening times vary on Event days, and are otherwise subject to change. Please click here for our full opening times and click here to see our list of Events. Q. Is there any special information for SAT NAV and GPS users? A. Yes. When planning your journey to Parham, please ensure that you use the postcode RH20 4HR. This will ensure you are directed to the correct entrance. Q. How long should we plan for a visit? A. With so much to see and do, many visitors devote the better part of a day to take in the House and Gardens, and enjoy refreshments in our Big Kitchen. We suggest you allow a minimum of 2½ hours to experience everything we have to offer. A. When you prefer to visit may depend on whether your interests overlap with other events and workshops happening at the House and Gardens. Our expert gardening team work hard to ensure that there is an excellent array of plants to see in our Gardens at the height of spring, summer and the early months of autumn. This means that whenever you visit, you can enjoy the best that each season has to offer. A. Dogs cannot be taken into the House with the exception of guide and assistance dogs, but are welcome on short leads in the Gardens. Dogs cannot be taken into the indoor catering facilities without the prior agreement of the Head of Catering. Covered and uncovered seating is available in the courtyard adjacent to the Big Kitchen. A. There is a designated picnic area close to the House for the use of visitors to the House and Gardens on the days when Parham is open. Visitors are asked to purchase their tickets before using this facility, and may be required to produce valid tickets/passes upon request. Please help us by using the bins provided or by taking your litter with you. Q. Can I access the shops/cafes without an entrance ticket? A. Parham Park Ltd is a charity and by law these ancillary facilities are for the benefit of visitors to the House and Gardens only. If you wish to use these facilities, then you must either purchase a ticket or be able to present a valid entry pass. Visitors are permitted to visit the Garden Shop from 10:30am until 12 noon on our standard opening days (excluding Event days) without having purchased a ticket. For details of which complimentary passes we accept, please see the Admissions section of our website. Q. Is smoking permitted on the estate? A. Parham Park operates a no smoking policy on the estate. Q. What footwear do you suggest we wear for our visit? A. Due to the uneven ground in the Gardens, we recommend wearing flat and comfortable shoes. Stilettos are not allowed in the House due to the damage they can cause to the historic flooring. Q. Can we buy plants from the Garden? A. Our Plant & Garden Shop sells over 200 herbaceous perennials, grown and hand tended on site by our gardening team. The shop is open to visitors free of charge from 10:30am until 12 noon on our standard opening days (excludes event days): please visit our Opening Times Calendar for details. Thereafter it is open from 12 noon to 5:00pm for paying visitors. Q. Are buggies / prams allowed in the Gardens / House? A. Yes they are allowed in the Gardens and can be left in the Entrance Hall whilst you are visiting the House. Q. Can we use a mobile phone? A. Although the mobile signal is generally poor, you are welcome to use a mobile phone during your visit. We ask that you please respect other visitors by keeping your phone on silent and not taking phone calls whilst in the House. Free Wifi is available in the Big Kitchen and Garden Shop. Q. Can I visit the park independently of the House and Gardens? A. Members of the public can use a sign-posted footpath leading from the entrance at Douglas Lodge (Cootham) across the park to an exit at West Lodge (Rackham). Apart from this, there are no other public rights of access to the Park. The Park is a site of special scientific interest and is also home to a herd of fallow deer. As such, dogs must always be on a lead and there is strictly no cycling anywhere on the Estate. St Peter’s Church, Parham is one of the five Wildbrooks Churches and is not in the care of Parham Park Limited. Services are on the first Sunday of the month at 9:15am and the third Sunday at 3:00pm in the winter and 6:00pm in the summer. Visitors are welcome to these Services. Members of the public can drive through the Park in order to attend a Service at St Peter’s Church, or to visit the Church when it is open. The Church is open to the public from 12 noon to 6:00pm Monday to Friday. For further information, please contact warden@parhaminsussex.co.uk. Q. Is there any concession pricing for Carers? A. To help our visitors with limited mobility to have a more memorable experience, accompanying Carers are admitted free of charge. Q. When can I use my RHS Membership / Gardeners’ World 2-for-1 / HHA Membership? A. Historic Houses Association Members are offered complimentary admission to the House & Gardens on standard open days (not applicable for Event days). RHS members can enjoy free entry to the Gardens on weekdays only (not applicable for Event days). Gardeners World 2-4-1 card accepted for Garden admission on weekdays and weekends (not applicable for Event days). Please note that Parham is not a National Trust property. Click here for full T&Cs. Q. What are the benefits of being a Season Ticket holder? A. Please find all benefits of Season Tickets here. Q. How to get a replacement Season Ticket? A. If you lose your Season Ticket, we are happy to replace it for you (£3.00 admin fee applies) – please email: enquiries@parhaminsussex.co.uk. Q. Is Parham wheelchair accessible? A. Parham Park has a small number of wheelchairs which members of the public are welcome to use. These can be booked in advance. The Gardens are accessible by path, and are otherwise very flat. 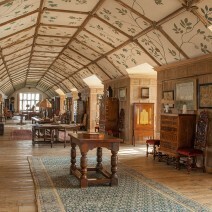 Visitors in wheelchairs can access the ground floor of the House (The Great Hall, Great Parlour and Saloon), but we cannot offer access to the first or second floors. Please ask for assistance from a member of staff. Q. Is there accessible parking? A. We have a sign-posted accessible parking area for visitors with limited mobility. Please speak to a member of staff in the car park or at the Admissions Kiosk on your arrival. Q. Do you offer group tours? A. We offer various packages for group bookings. Please click here to find out more or contact us with your enquiry. Q. Can we organise a school visit? A. We can organise a school/college visit. Please contact the Estate office on 01903 742021 or email enquiries@parhaminsussex.co.uk and we will be happy to help. Q. Can we take photographs? A. 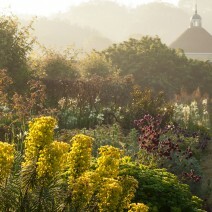 All visitors to Parham are allowed to take photographs in the House and Gardens for their own private use. Photography in the House (including filming) is only permitted without flash. Any photographs taken at Parham are strictly for private use, and enquiries about selling or publishing photographs should be directed to marketing@parhaminsussex.co.uk. By visiting Parham House & Gardens you are entering an area where photography, audio and video recording may occur. By entering the event premises, you consent to such recording media and its release, publication, exhibition or reproduction to be used for promotional purposes. 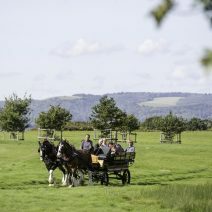 If you have any enquiries please email marketing@parhaminsussex.co.uk. Q. What are your rules about drone filming and photography? A. The use of UAVs (Unmanned Aerial Vehicles) or drones is not permitted on or over Parham House & Gardens without prior approval. If you would like to arrange drone flying for filming or photography, please contact marketing@parhaminsussex.co.uk to discuss your project. Q. Does anyone live in the house? A. Parham House is a family home lived in by Lady Emma and Mr James Barnard and their two sons. Q. What is the history of the estate? A. The land on which Parham House is situated once belonged to the Monastery of Westminster. In 1540, after the Dissolution of the Monasteries, it was sold to a London mercer named Robert Palmer. The foundation stone of the current House was laid in 1577 by his great-grandson, Thomas (later Sir Thomas Palmer, 1574 – c.1605). Since the property was first sold to Robert Palmer, only three extended families have lived at Parham; the Palmers, the Bisshopps, and the Pearsons. Q. How large is the estate? A. The Parham estate is currently comprised of 875 acres or 354 hectares.